What is wonderful about French toast is that you can make it as healthy or decadent as you want it! So yesterday morning, I drove to my local Whole Foods to buy my first loaf of organic bread. The store bakes several different kinds of regular and organic breads daily. The baker’s suggestion was brioche and challah breads, but either one was organic, so I selected the French loaf. To make this healthy and yummy, I added bananas and crunchy walnuts! In a shallow dish, whisk egg and milk together. Preheat 2 teaspoons oil in a nonstick frying pan over medium heat. Soak both sides of bread slices in egg-milk mixture. Cook both sides of bread until golden brown. 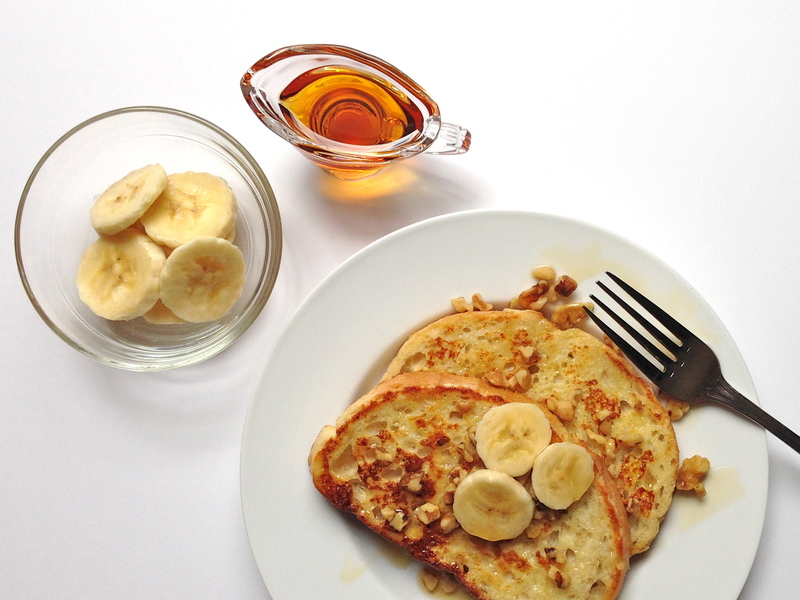 Sprinkle with walnuts, add sliced bananas, drizzle with maple syrup and enjoy! Serves 2. Blogger’s note: This recipe can easily be multiplied. Ideally, bread should be at least a day old. This is a healthier version of French toast, so no butter was used. But you can certainly add it!